Meet black belt Cadell - small but mighty! CADELL Coombes might be just 4ft 5ins but proved he's a giant when he recently became a black belt at just 10 years of age. The Begbrook Primary Academy pupil achieved his 1st degree black belt after attending Fishponds Taekwondo since he was three. Cadell, who lives in Stapleton, trains twice a week for an hour and for an additional two and half hours three times a month. Mum Su said her son's success was even more extraordinary given that he had to sit his first exam in Korean. "The dedication and effort he's put in is amazing. A lot of people think it's a children's black belt but it's not, it's an adult black belt that he's achieved. "Cadell is really small for his age but he's put so much commitment in and competes both locally and nationally. "Begbrook Primary Academy were very supportive, helping Cadell prepare for his written exam, the first exam he’s ever taken. He had to learn it in Korean which many people don't realise. "Cadell is very sporty and wants to continue with taekwondo. When he's older he'd like to be a vet but often changes his mind to a crime scene investigator!" Cadell was one of a group of young people from Fishponds Taekwondo who achieved black belt success. The four lads recently travelled to Nottingham to take their taekwondo black belt grading and all passed. 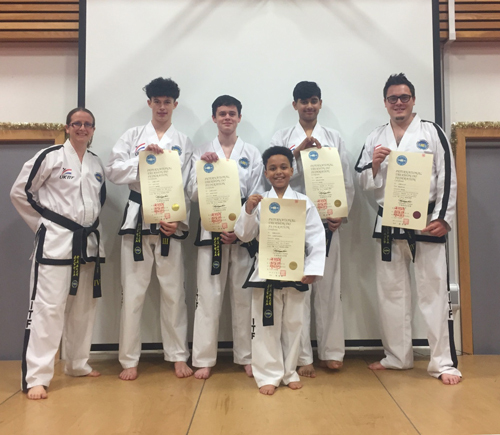 Joel Cassar, 16, was promoted to 3rd degree black belt, Jamie Cassar, 14, is now a 2nd degree black belt and Shahzaib Salam, 14, was promoted to 2nd degree black belt. Both Joel and Jamie attend Bristol Metropolitan Academy with Shahzaib going to Cotham School. The lads celebrated their hard earned success with club members, family and friends at a black belt presentation evening. Instructor Dave Lear, who runs the club with wife and fellow instructor Karen, had some good news of his own after he was recently promoted to 4th degree black belt and completed the international instructor certificate. Karen said: "After years of training, grading, learning patterns, sparring, competing and learning their Korean theory, all their hard work has paid off. I am incredibly proud of everyone who graded. Being a black belt takes years of dedication and effort, it’s about attitude and never giving up - it’s an achievement for life." Fishponds Taekwondo has been running for 11 years and is affiliated to UKITF, part of the International Taekwondo Federation (ITF).